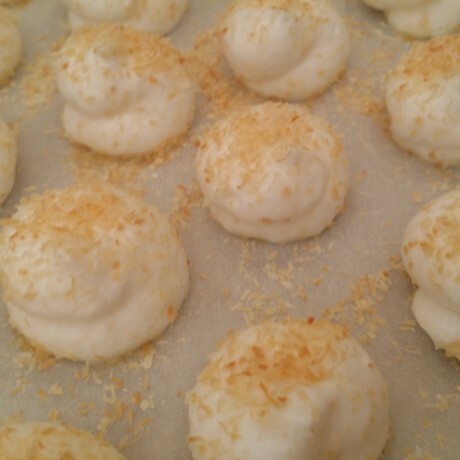 Coconut Meringues: The fluffiest, lightest melt-in-the-mouth bitesize meringues, offering a unique taste experience not to be missed. As well as Coconut, we have 10 more flavours on offer. Nutritional Values per small box (10g): 106 kj/25 kcal, fat 0.9g of which saturates 0.8g, carbohydrates 3.7g of which sugars 3.4g, fibre 0.0g, protein 0.7g, salt 0.01g. Nutritional Values per large box (25g): 265 kj/63 kcal, fat 2.4g of which saturates 2.0g, carbohydrates 9.2g of which sugars 8.5g, fibre 0.0g, protein 1.7g, salt 0.02g.